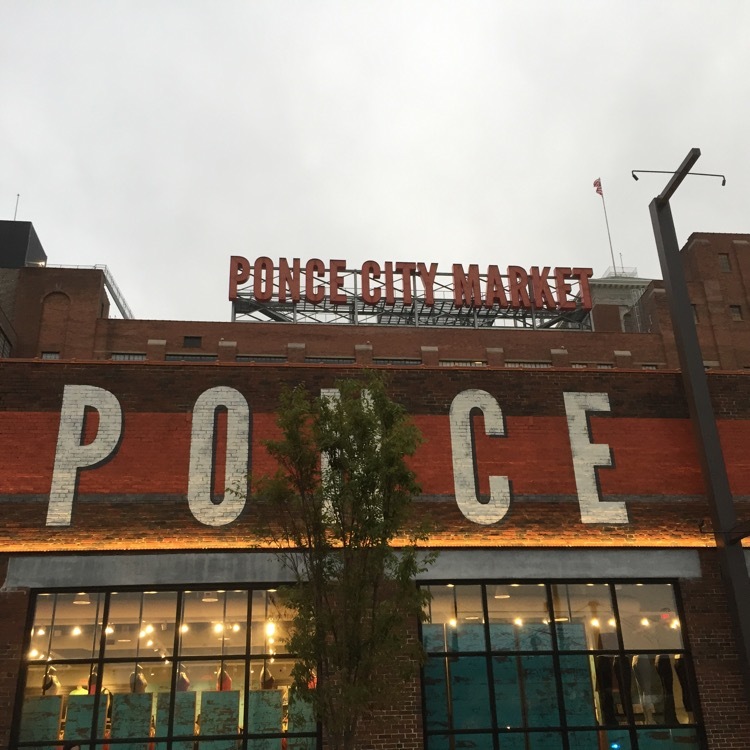 Finally, Ponce City Market is (sort of / mostly) open. At least, some of the food places and stores are. 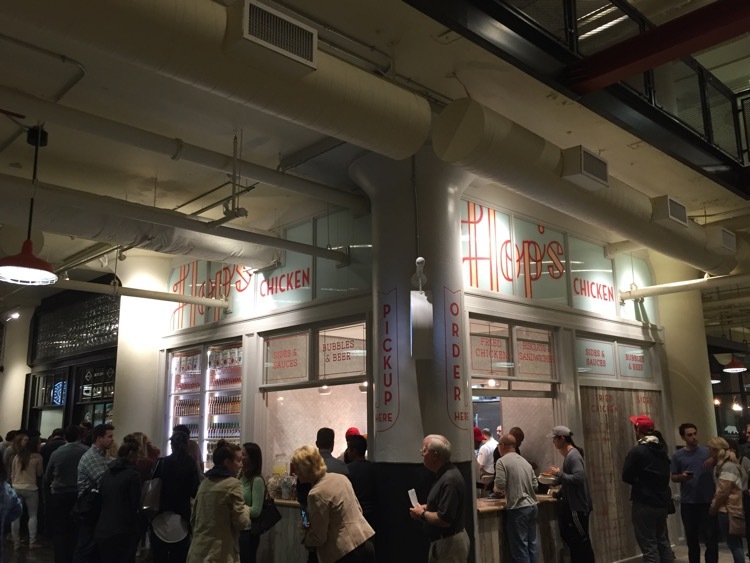 Over last weekend our daughter sent us a text from H&F Burger, along with a survey of what was open. So when Friday night rolled around and we were headed to dinner with another couple, off we went to PCM. As we parked, we asked the valet (they also have self parking, which is free – for now – but it was raining and I didn’t see anything close) where he had eaten and he said he really liked the chicken place but that the line was always crazy. That was a good omen, as I had Hop’s Chicken on my mind. Technically, it was Linton Hopkins fried chicken had been on my mind for years. He used to serve it, one Sunday night a month, at his Restaurant Eugene. Now, his (excellent) fried chicken is available seven days a week. I’ll say this as simply as possible: Get thee, hence, to the chickenry. 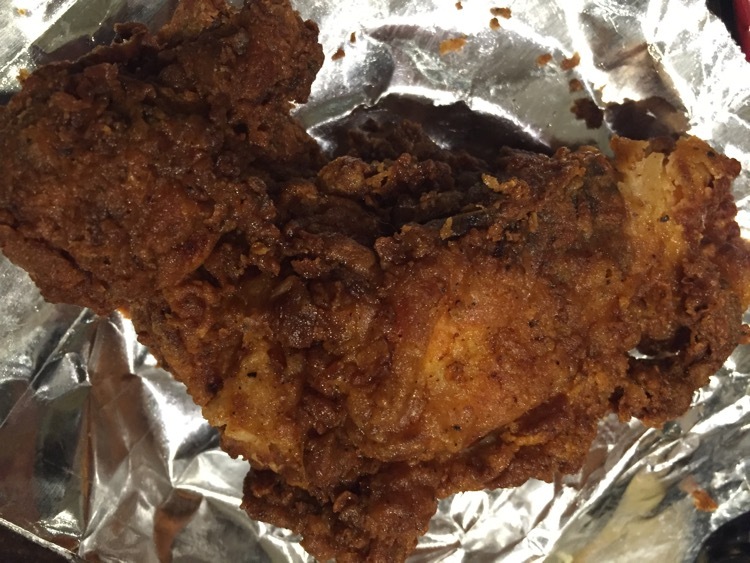 A couple of months back I raved about the wonderful chicken, fresh to the city, at Gus’s Fried Chicken. And now we get a second awesome fried chicken place in less than three months? 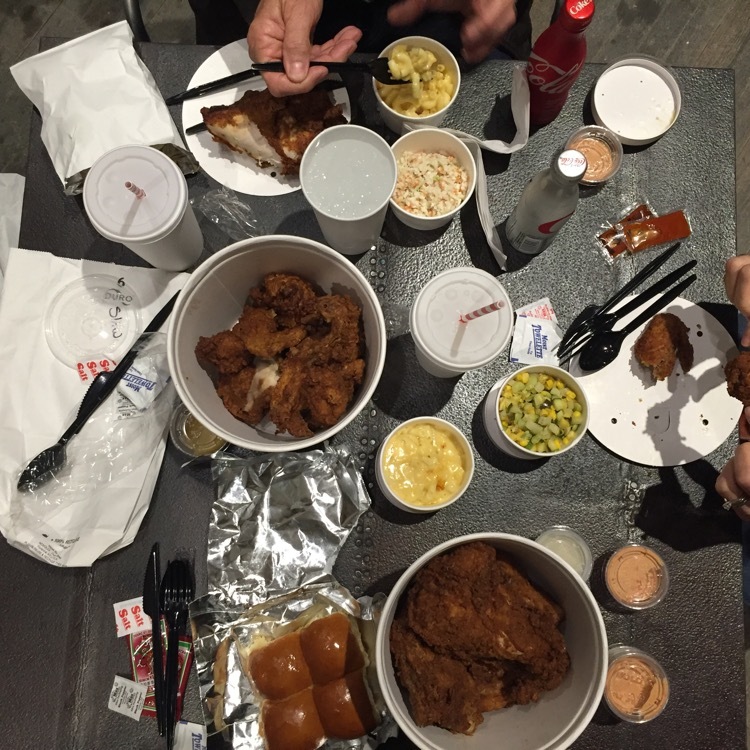 2015 may be the year of fried chicken. I could live with that. 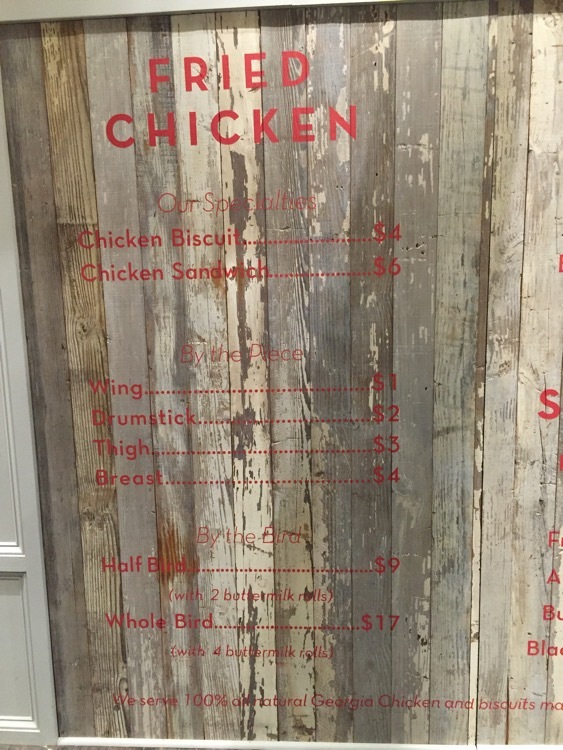 We ordered a whole bird (two each of breasts, wings, thighs and legs), but you can also order a half bird (one of each), chicken by the piece or chicken on a biscuit or sandwich. We ended up with a table full of food – there are two “whole” birds on the table (the other couple had chicken as well). 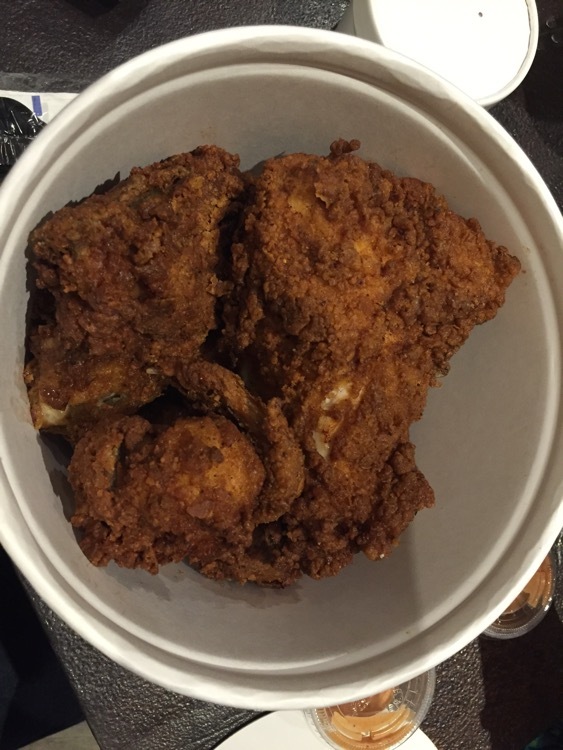 The whole chicken is served in a bucket (hearkening back to the KFC buckets of my childhood) and is very close to cooked-to-order. During busy times the chicken is hot because they’re cooking so much that they go through it all. In slow times, you have to wait for it to be prepared. We also ordered two sides – mac-n-cheese and a succotash. Jo said that this may be the best mac-n-cheese that she has had “out” any where, and I’d be hard pressed to argue with her. It was simple – no toppings and no fancy ingredients. It was just noodles and cheeses, but we were immediate fans. The succotash was a combination of zucchini, squash, baby limas and corn and was served, oddly, cold. It was chopped finely and had a really good flavor and, likely, would have been wonderful if it was was served hot. The lady that took our order said that this succotash was for summer and that’s the reason it was served cold. Look at the crispness of the skin! The half and whole birds, which were served with rolls on our first visit were served with biscuits on the second trip. This was definitely a positive. 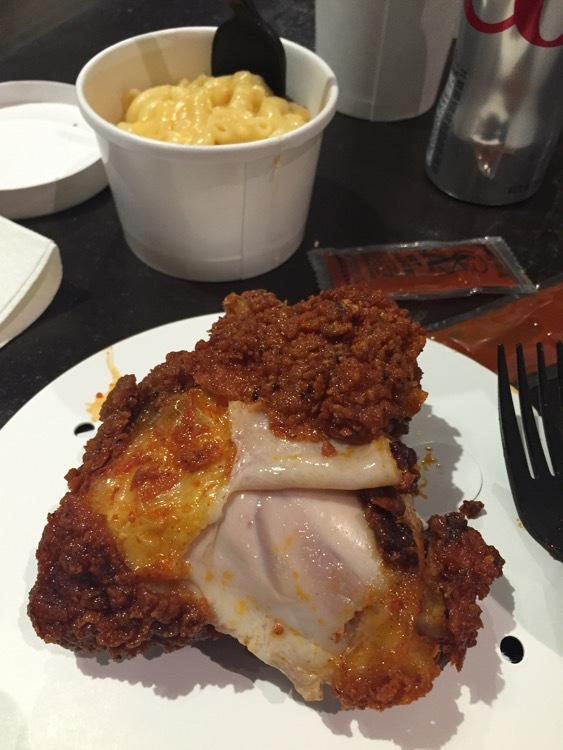 Second, you can now get “hot” chicken. This is a half bird ordered Hot / Nashville-style. I watched them putting my order together and I saw a young lady brushing the cayenne paste onto each piece with a basting brush. 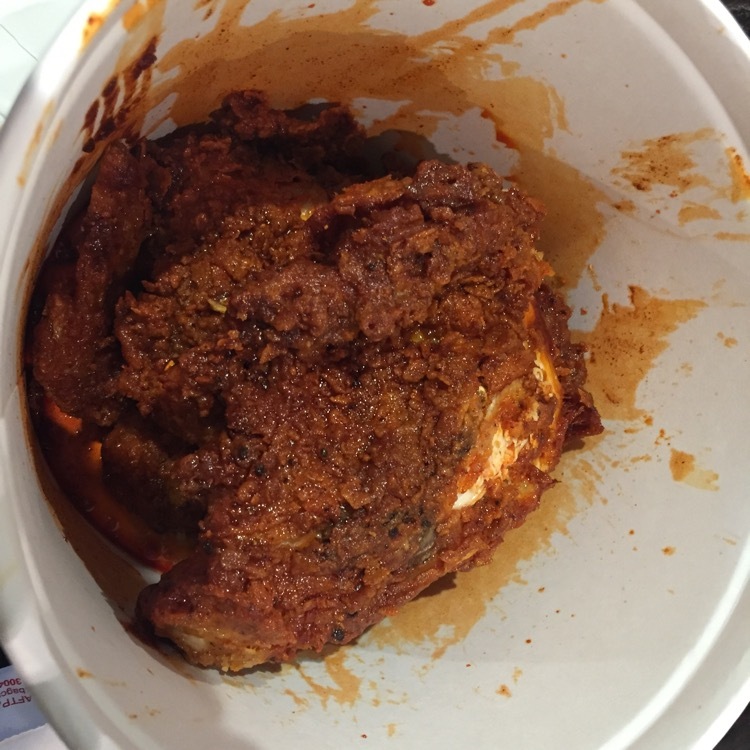 And she was not stingy – the bottom of the bucket was full of crispies (those flakes of skin that fall off the chicken while cooking) and hot sauce. Note: this chicken is hot. It would be “medium” at Prince’s and most folks may find it too hot. I thought it excellent. The third thing is definitely not a positive – the parking is no longer free. It’s $1.00 per half hour, with a different rate that kicks in at four hours. (They do have one lot with free 30 minute parking at the entrance of North Avenue). I’m fairly certain that I have an issue with this – paying to park so that you can shop/eat, in a place that has plenty of parking available, seems kind of chintzy to me. I’ll be curious to see if that aspect lasts.